To finish off yesterday – we were taken, as guests, to a lovely Italian restaurant at Black Rock. We were met at the door and shown to a table with a white linen tablecloth and serviettes. The service was impeccable. The food was lovely; I’m sure even Shan would have been impressed. I had grilled red emperor with salad, Les had veal scaloppini with mushrooms, Aunty Pat had rack of lamb, Sue had garlic prawns, Lee and Asami shared a seafood platter and Gary had pasta (being of Italian descent and the Italian restaurant being his idea). This morning was very wet after heavy last during the night, but we managed to pack up without getting wet. Left Dingley at 9.30am and travelled, very slowly, along the Monash Freeway to the Westgate Freeway and the Western Ring Road. To make driving easier, a new link from the Ring Road to the Western Highway, to Ballarat, was opened only a few weeks ago. It was a balmy 14 degrees when we left Melbourne and this very quickly dropped to 9 degrees, and raining, by the time we reached Ballarat. We bypassed Ballarat and stopped for lunch at Ararat, which wasn’t much warmer! Fortunately the rain had stopped, although the nice lady in Horsham told us they had 60+ mils earlier this week, which accounted for the soggy ground. Just west of Ballarat were a couple of large wind farms, one of them was VERY large. We passed lots of eucalypt plantations today, some of them were even e.globulos. We even saw quite a few newborn lambs, who are probably finding the weather a little cool. The road was dual highway to the end of the Ballarat bypass and pretty good after that as well. Lots of trucks on the road. 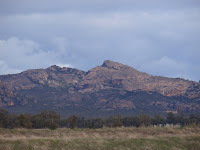 We passed through Great Western, with its large Seppelts winery and followed the Grampians for a while before reaching Horsham. We are staying at the Wimmera Lakes Caravan Resort, Horsham. Huge sites and not many people, so it should be quiet.